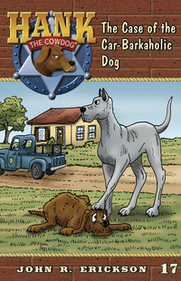 What happens when Hank the Cowdog finds himself stuck in town and facing the mean, monster Great Dane, “Rambo”? Rambo’s only weakness is that he’s a car-barkaholic. He just can’t resist chasing and barking at passing cars. Join Hank as he runs the Eighteen-wheeler Marathon, charms his nieces and nephews with tales of courage, and enlists Dog-Pound Ralph in a scheme to banish Rambo.